Ontario is Canada's second largest Province, 1.1 million sq. km bounded on the north by the Hudson Bay, in the south by the Great Lakes and St. Lawrence River. Its vast land goes from flat bogs and small tree forests of the north, to dense forest, 1000 lakes, and rocky hills to the more populated lands of the south. Ontario extends below the 49th parallel more than any other part of Canada. Extending between Lake Ontario and Lake Erie to the East and Lake Huron to the West is where Ontario wine producers grow their grapes. The fertile soils and moderate climate combine to produce orchards and vineyards yielding fruits of unique character and supreme quality. The word Ontario means sparkling water. To some of us, it means tasting the fruits of the soil..wine. Tony Aspler in his book "Wine Lover's Companion" refers to Ontario icewine as the world's best tasting secret. Perhaps today we should Ontario wines are the world's best tasting secret. The Ontario growing region lies most between the 52º and 41º placing them in the middle of the northern grape growing belt. 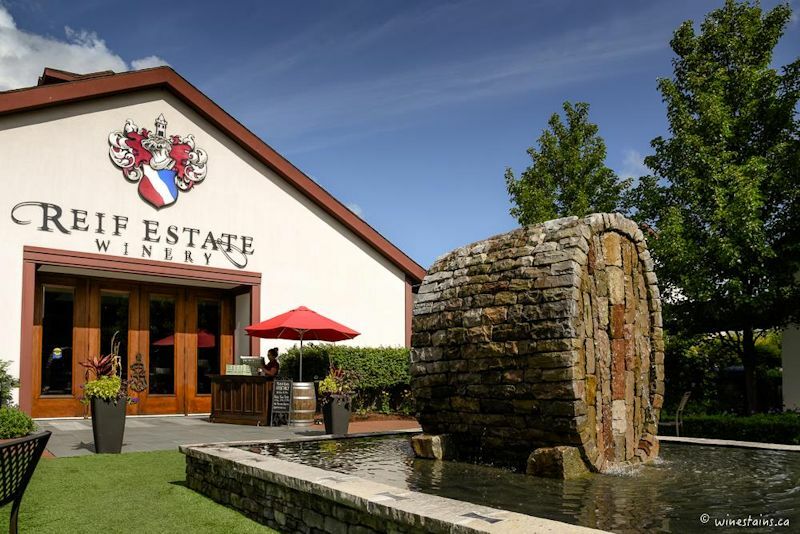 The same latitude as Bordeaux, France and the Northern wine regions of California. Most Ontario Vineyards are located in or near the historic Niagara-on-the-Lake, Ontario's oldest community. The following information has been provided to this website by VQA Ontario* We appreciate their assistance in helping us provide you with the best information available. The Niagara Peninsula is the largest Viticultural Area in Ontario (and Canada), accounting for almost three quarters of Canada's grape-growing volume with approximately 11,000 acres of wine grapes in place. Situated at approximately N43º latitude, the growing season sunshine is comparable to the Languedoc-Rousillon in France, south of both Burgundy and Bordeaux, or Tuscany, Italy. Wines grown in such temperate climates can produce superior fruit, with more complexity and intense flavours than in warmer climates. It is bordered by Lake Ontario on the north and the Niagara River on the east and the Welland River and Hamilton to the south and west. Where the Niagara River flows over the Niagara Escarpment, the most predominant topographical feature of the peninsula, the river is transformed into one of the seven great wonders of the world, Niagara Falls. The Niagara Escarpment is a 335 metre (575 ft.) high ridge that winds for 725 km (550 miles) from New York State through Queenston, Ontario (near Niagara Falls) to Tobermory in northern Ontario, where it continues underwater to Manitoulin Island and then into the state of Michigan. Passing through the Niagara Peninsula, the Escarpment provides the essence of this appellation. Vineyards benefit from the lake's offshore breezes, which are reflected back to the lake when they reach the escarpment, maintaining constant and active airflow. This circulating activity prevents cold air from settling in lower-lying areas during threatening periods of frost, and maximizes the moderating effect of the warm waters of the lake. The region's temperatures are influenced by Lake Ontario, which acts as a hot water bottle in winter – raising winter temperatures on land from its summer-warmed waters. In spring, breezes from its winter-cooled waters help to hold back the development of fruit buds until the danger of late spring frosts has passed. Lake Ontario also cools the summer air so that grapes do not ripen too quickly, and then keeps the fall air comparatively warm so that the first frost is delayed, thus extending the growing season. Approximately 85% of Ontario's VQA wineries are located in the Niagara Peninsula. 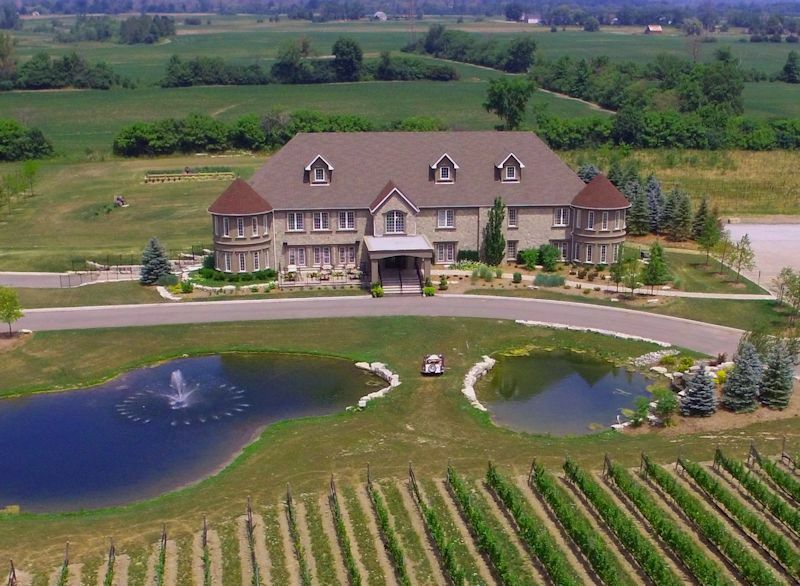 The vineyards of Southwestern Ontario cover over 500 acres situated in a flavoured mesoclimate along the north shore of Lake Erie in Essex, Kent and Elgin counties, except that part of Kent county lying to the north of the Thames River. The grape growing area stretches along the bow-shaped shoreline of Lake Erie from Amherstburg to Leamington, with a further concentration of vineyards around the town of Blenheim to the east. Soil structures vary from gravely loam to clay and sandy loam. With southern exposure complemented by the moderating effect of the lake, this Viticultural Area produces some of Canada's finest wines. Lake Erie is the shallowest of the Great Lakes affording it the warmest surface temperature of the five lakes. This region also benefits from an abundance of sunshine, and as a result its fruit often goes to market weeks before that from other parts of Ontario. Lake Erie North Shore lies at a latitude of approximately N 42°, similar to well known wine growing regions in Navarra, Spain and Abruzzi, Italy. Pelee Island, marginally nearer the equator than Rome at N41° 45' latitude, is Canada's most southerly point, and accordingly, it enjoys a longer growing season than any other wine region in Canada. Situated in Lake Erie, 25 kilometres (15 miles) off the mainland, Pelee Island has 500 acres under vine. The southerly location and surrounding waters give rise to an early harvest and picking usually begins at the end of August. Even late-harvest grapes are often in by mid October. 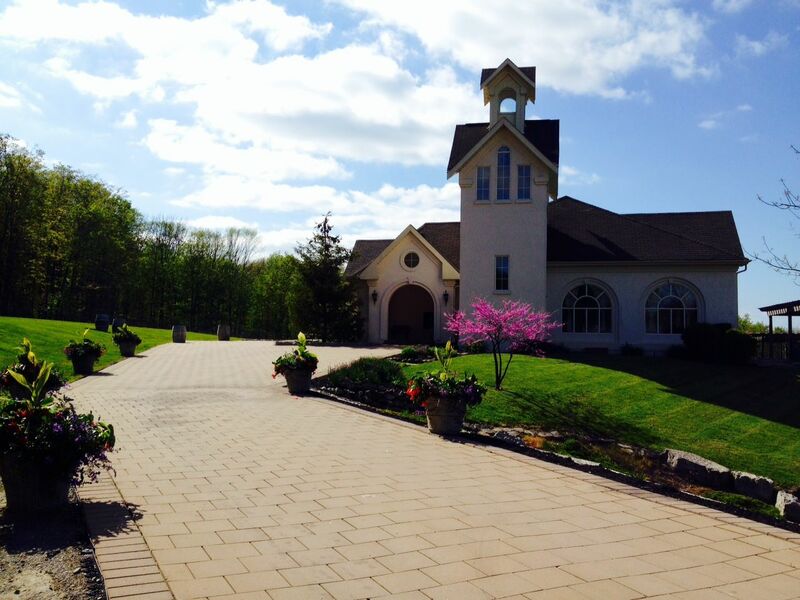 Prince Edward County, located in southern Ontario just west of Kingston, recently emerged as a wine growing region. The appellation includes lands within the political boundaries of Prince Edward County and surrounding areas to the north and east. The area has a long history of fruit production, notably apples, and enjoys the moderating effect on temperatures of an extensive shoreline along the north shore of Lake Ontario. The geology of the region is characterized by calciferous bedded limestone and soils are typically well drained, rocky and can be relatively shallow, but with variations across the region. Plantings are primarily vitis vinifera varieties with an early emphasis on Chardonnay and Pinot Noir. The potential for many other grape varieties is being explored as the region develops viticultural practices that best express the terroir of the “County”. Ontario's newest region seeking AVA. status. It runs along Lake Erie North Shore Region just east of the current Lake Erie North Shore AVA and west of the Niagara region .Documentation shows that missionaries Dollier and Galinee made wine from grapes grown wild here in the late 1600s. 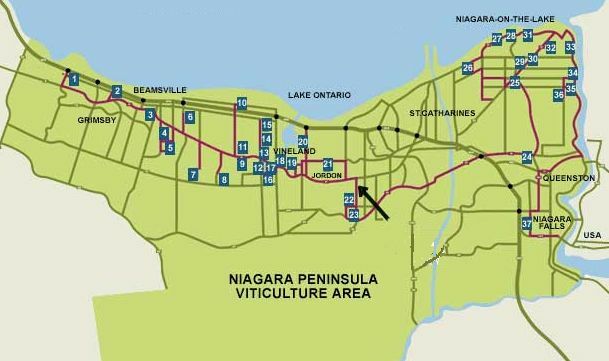 As a result of decades of grape growing experience and extensive research, ten unique growing areas within the Niagara Peninsula have been identified. These sub-appellations include areas on the plains close to Lake Ontario and the benchlands of the Niagara Escarpment. Wines owe their character to a combination of origin and the winemaker's art. Together, they give us wines that are unique from the different appellations. Only wines made from 100% grapes grown in a sub-appellation are permitted to make the corresponding claim of origin on the label. In addition to sub-appellations, two regions have been created to regulate the use of widely recognized names – Niagara-on-the-Lake and Niagara Escarpment. Niagara-on-the-Lake may appear on the label of a wine sourced from the growing area east of St. Catharines and Niagara Escarpment may be used on wines sourced along the bench area west of St. Catharines. To use these regional designations, at least 85% of the grapes used must come from the named area, with the balance grown in the Niagara Peninsula. Origin may be further specified by one of the following sub-appellations if 100% of the grapes used originate from the stated sub-appellation. The Niagara River appellation is a small strip of land running along the river from John Street to Dee Road and inland to the first Concession road. Niagara's famous scenic tourist route, the Niagara River Parkway weaves up the length of the appellation. Soils in the area are primarily stratified glaciolacustrine fine sands, providing natural drainage and strong encouragement for vines to develop deep root penetration. The fast flowing Niagara River creates convectional currents that draw cooler air into the gorge, moderating vineyard temperatures and reducing frost risks. Slopes in the area are predominantly east facing which is unique in the region. These factors create excellent growing conditions for tender varieties and contribute complex flavours to the grapes. Niagara Lakeshore follows the shoreline of Lake Ontario from the Welland Canal east to the Niagara River and proceeds inland for approximately 3 kilometers. The primary influence on this appellation is the proximity of the Lake and its year round effect on temperatures. Soils in the area are primarily glaciolacustrine near shore and deltaic sands and silts deposited on Halton Till with relatively high water- holding capacities. These light soils together with the long growing season contribute to flavour development in grapes and mature, full bodied wines. Four Mile Creek comprises the fertile plain that makes up central Niagara-on-the-Lake. It lies slightly inland and below the bench of the Niagara Escarpment providing for warm days and cool nights during the growing season. Soils are red shale with a high silt and clay content, good water retention and ideal characteristics for vines.The relatively flat topography leads to abundant sunshine and warm days giving growers the opportunity to grow many varieties. Four Mile Creek is the largest sub-appellation in the Niagara Peninsula. St. David's Bench describes the natural bench formed when glaciers carved out the Niagara Escarpment. The land rises from the historic shoreline of Lake Iroquois towards the base of the escarpment where a steep ridge provides steady air circulation. Topography of the bench is complex and the sub-appellation approximately follows the contour lines that define the escarpment and runs from the Niagara River to Beechwood Road. Moderately well drained glaciolacustrine silty clays combined with ground water flow from the base of the escarpment provide steady moisture throughout the growing season. The escarpment topography also provides early spring warming with good air circulation and frost protection. Niagara-on-the-Lake is made up of all land within Niagara River, Niagara Lakeshore, Four Mile Creek and St. David's Bench sub-appellations. Niagara-on-the-Lake has long been used to refer to the lands in this area and to wine that originates there. 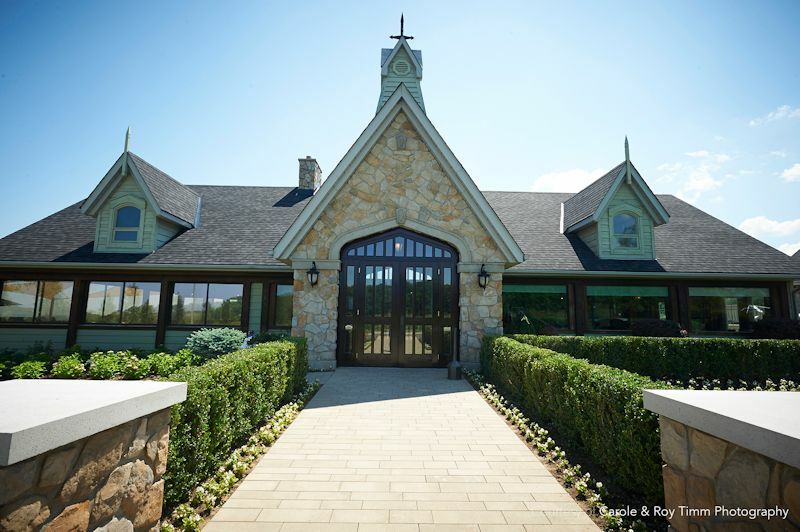 To use this municipal designation, a wine must be sourced from at least 85% of grapes from the area with the balance from within the Niagara Peninsula. Creek Shores is bounded by Lake Ontario, Twelve Mile Creek, Twenty Mile Creek and Jordan Harbour, and Regional Road 81 to the south which defines the lower boundary of the escarpment bench. It is a delta shaped area characterized with long gentle slopes and an abundance of small creeks draining into Lake Ontario. Soils are a complex series of glacial, fluvial and lacustrine sediments underlain by Queenston shale. Temperatures are moderated by Lake Ontario and smaller water bodies and spring warming and bud break are slightly delayed. The Lincoln Lakeshore follows the Lake Ontario shore from Winona Road to Jordan Harbour and Twenty Mile Creek, pushing inland to Regional Road 81. This land mass is characterized by long gentle slopes that grade from the Lake Iroquois Bluff and numerous seasonal streams. Glacial, fluvial and lacustrine sedimentary deposits have resulted in a variety of soil types and depths, but soils are primarily light-texture and well to moderately-drained. Again, Lake Ontario has a major impact and provides longer, tempered growing conditions and even ripening. Short Hills Bench is the most easterly of appellations making up the Niagara Escarpment. It includes the land south of Regional Road 81 rising up towards the Escarpment Brow and situated between Twelve Mile Creek and Fifteen Mile Creek. Laid down through a long history of geological events, the undulating topography of Short Hills provides long gentle slopes with excellent drainage and sun exposure. Warm sunny days and cool nights are perfect for developing grape flavours derived from the complex soil in the area. Soils makeup is chiefly glaciolacustrine deep water stratified clay and silt and stratified brown silty clays deposited on clay loam. The Twenty Mile Bench is another segment of the escarpment bench, from Fifteen Mile Creek to just west of Cherry Avenue. This stretch of the bench is bisected by Twenty Mile Creek and shows complex topography with a double bench formation rising from Regional Road 81 with changing slopes to the brow of the escarpment. Glacial activity has provided deep clay and till surface soils, with a high proportion of limestone and shale. The sheltered north facing slopes offer year round temperature moderation. The Beamsville Bench completes the Niagara Escarpment running from just west of Cherry Avenue to Park Road in the east. The narrow bench area is the sloped plateau immediately below the face of the escarpment continuing down to Regional Road 81. The appellation benefits from the air circulation, frost protection, slopes and elevation provided by the escarpment topography. The continual air circulation results in minimal temperature swings and consistent growing conditions. Soils are generally deep and well-drained and numerous streams provide seasonal water supply. Although a relatively small appellation, the Beamsville Bench exhibits a unique set of conditions that provide a natural complexity to the wines originating there. The Short Hills Bench, Twenty Mile Bench and Beamsville Bench collectively form the Niagara Escarpment which represent the benchlands north of the Niagara Escarpment and west of St. Catharines. The Escarpment is widely recognized as a designation for all lands on the “bench” in recognition of this dominant topographic feature. To use this broader designation, a wine must be sourced from at least 85% of grapes from the area with the balance from within the Niagara Peninsula. Vinemount Ridge is the appellation above and south of the brow of the escarpment. Covering a broad area, it is unique in that it exhibits shallow mostly south facing slopes. The geology in the area is dominated by the Vinemount Moraine and to the east, the Fonthill Kame. This provides early spring warming to its deep clay soils and early budburst for the vines. The area enjoys warm daytime temperatures and cool nights. Ontario is the country’s leading grape producer, accounting for about 85% of all Canadian production. The Niagara Peninsula accounts for over 93% of Ontario's grape-growing volume. Grapes are the highest-ranked Ontario agricultural commodity, and represent 35% of the farm value of Ontario commercial fruit. The total farm gate value of Ontario grapes exceeded $88.6 million in 2012. In 2012, there are 17,000 acres of vineyards in Ontario. In 2012, winemaking was the dominant use for Ontario grapes. Over 97% of production was used for wine products and under 3% for juice, jams and other grape products. As a tourism destination, Niagara attracts nearly 20 million visitors annually; 1.6 million people visit the province’s wineries each year. Grape production enhances the environmental beauty of the province and preserves our rich agricultural heritage. This is priceless.